In addition, a 61st bonus game, the original two player Baseball, will be available in an exclusive version at Dollar General. Sam's Club will have a version with the standard selection of 60 games, but a handful of additional overlays. I should have an extensive first look at the new hardware some time in August. Finally, for those interested in the history of the Mattel Intellivision and 19 other of the greatest game playing platforms of all-time, be sure to check out my recent book, Vintage Game Consoles: An Inside Look at Apple, Atari, Commodore, Nintendo, and the Greatest Gaming Platforms of All Time. Licensing, licensing, licensing. That kind of thing changes all the time, though, so it doesn't preclude it being included in future versions. In any case, it's easy to focus on what these things don't have rather than what they do have. What they all do have is actually pretty impressive. It all comes down to licensing. I agree, NO Burgertime or Lock & Chase is a shame. Would also love to have had Commando & River Raid. 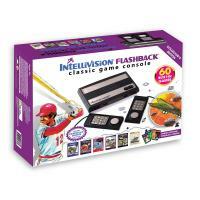 If there's a follow-up to the Intellivision Flashback, there's a good chance third party games will be included. While not everything is available to license, certainly some of those titles will be a possibility. Thanks for the list, I'm really looking forward to buying one in October. I was surprised not to see skiing on the list. Did I miss it or is it not included? Several people have asked about that. It was not on the official list, so presumably it's not included. I'll double check when the review unit comes. Next week, though it looks like one retailer broke street date already.